Quick Backlash Calibration V.2 by Muele is licensed under the Creative Commons - Attribution - Share Alike license. 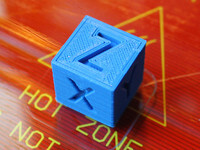 This is a method for quickly getting a good backlash calibration on your 3D printer. You just zero out the backlash compensation in the software. Then print the objects, Read the correct value and enter it as your new backlash compensation and be done with it. The files have been created with the M3D Micro in mind but should work for all 3D printers of the Cartesian type. It will not work for delta printers. calibrated. The print is just a single layer and it needs to be printed just right across the entire surface. 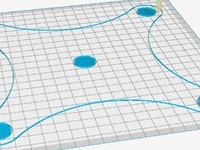 You can find more information about bed leveling below. Before starting the first print make sure to set backlash compensation to zero. Make a note of the old values in case you need to go back. Watch the print start and remove the extra filament that is extruded in the beginning. It is just to prime the nozzle. The included files will make 200 samples. You have to study these samples very very carefully. You have to find the sample with the highest possible value that does not curve. We are talking about a curve that only moves 0.01 mm to the side. It sounds impossible to spot. But it is actually doable. I recommend having a ruler in one hand and a flashlight in the other. You can also use a magnifying glass or take a good quality picture and then zoom in. When you have located the correct sample, calculate the backlash value using the chart/picture above. I think it is a good idea to make three prints and take the average value spotted for each. If one of them is way off disregard it and make another. If in doubt choose the lower value. Repeat for the other axis and enter the values you found in your printer software. I encourage you to post an "I made one" with a photo to help other users get a hang of reading the result. Notice there is a customizer for this so that you can tinker with the line width and layer height to get a file the suits your slicer and printer. Where in the software do I adjust it? You need to set the values to 0 before using the Quick Backlash Calibration. I love how this simplified illustration explains the issue. The point of the calibration is to get to know how much the first cog has to move extra when the direction changes. We want to know this in a precision measured in hundreds of millimeters. There are of course more to it than a single gear connection. There are more gears and belts with slack as well. But the moving picture illustrates the problem well. Compared to version 1 I doubled the number of samples to reduce the complexity when getting started on this and improved tolerance towards poor bed leveling. Other than that the files are identical. If you are having success with version 1 you will have no benefit in changing to version 2. Say thanks by giving Muele a tip and help them continue to share amazing Things with the Thingiverse community. Say thanks and help Muele continue to share amazing Things with the Thingiverse community. You'll need a PayPal account to tip Muele. Click the button below and you will be redirected to PayPal. Once the payment is complete, you'll be brought back to Thingiverse.